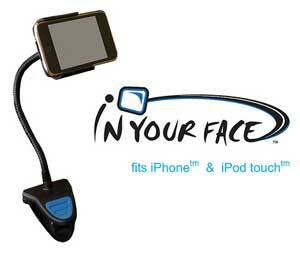 The In Your Face iPhone and iPod Touch Stand features a clip, a flexible 8” neck and an adjustable swivel head. Use it on a plane, at your desk, on your treadmill or in your car for maximum screen visibility. You can get one of your own for $29.95.